The Italian Christoper Columbus arrives in Americae bi Gergio Deluci (1493). The 15t century wis the century which spans the Julian years 1401 tae 1500. In European history, the 15t century is seen as the brig atween the Late Middle Ages, the Early Renaissance, an the Early modren period. Mony technological, social an cultural developments o the 15t century can in retrospect be seen as heraldin the "European miracle" o the follaein centuries. In releegious history, the Roman Papacy wis split in twa parts in Europe for decades (the so-called Wastren Schism), till the Cooncil o Constance. The diveesion o the Catholic Kirk an the unrest associatit wi the Hussite movement would gie rise tae the Protestant Reformation in the follaein century. Constantinople, the caipital o the Eastren Roman Empire, faws tae emerging Ottoman Turks, forcin Wastren Europeans tae find a new trade route. 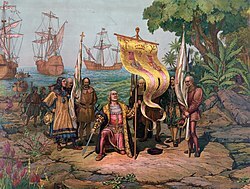 At the same time, the beginnin Age o Sail allaes Spainyie an Portuguese splorations led tae the first European sichtings o the Americas (the New Warld) an the sea passage alang Cape o Guid Hope tae Indie, in the last decade o the century. The Spainyie Reconquista leads tae the final faw o the Emirate o Granada bi the end o the century. In Asie, unner the rule o the Yongle Emperor, who biggit the Forbidden Ceety an commandit Zheng He tae splore the warld owerseas, the Ming Dynasty's territory reached its pinnacle. Tamerlane established a major empire in the Middle East an Central Asie, in order tae revive the Mongolian Empire. In Africae, the spread o Islam leads tae the destruction o the Christian kinricks o Nubia, bi the end o the century leaving anly Alodia (which wis tae collapse in 1504). The umwhile vast Mali Empire teeters on the brink o collapse, unner pressur frae the risin Songhai Empire. In the Americas, baith the Inca Empire an the Aztec Triple Alliance reach the peak o thair influence. Wikimedia Commons haes media relatit tae 15th century. This page wis last eeditit on 4 Januar 2017, at 00:28.